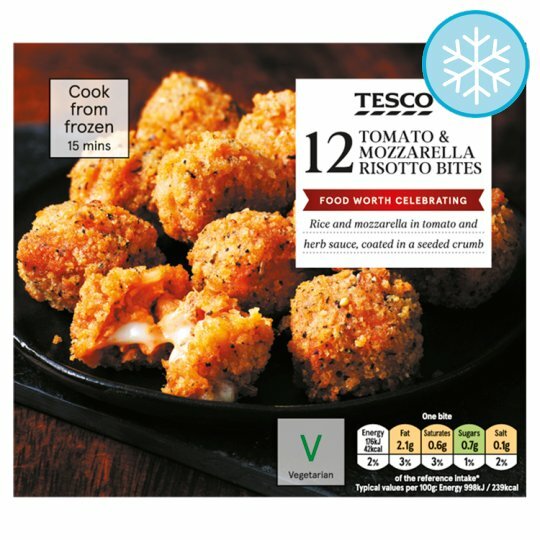 INGREDIENTS: Tomato (21%) [Tomato, Tomato Paste], Rice (19%) [Arborio Rice, Brown Rice], Wheat Flour [Wheat Flour, Calcium Carbonate, Iron, Niacin, Thiamin], Mozzarella Full Fat Soft Cheese (Milk) (12%), Onion, Rapeseed Oil, Sundried Tomato Purée [Water, Tomato Purée, Sundried Tomatoes, Sunflower Oil, Spirit Vinegar, Sugar, Onion Purée, Salt, Garlic Purée, Black Pepper, Asafetida], Full Fat Soft Cheese (Milk), Stabiliser (Cellulose), Potato Starch, Salt, Yeast, Basil, Millet, Sunflower Seeds, Poppy Seeds, Malted Wheat, Barley Flakes, Malted Rye Flakes, Garlic, Malted Barley Flour, Wheat, Wheat Bran, Olive Oil, Black Pepper, Oregano, Linseed, Acidity Regulator (Citric Acid). Keep frozen at -18C or cooler. Instructions: For best results cook from frozen. Remove all packaging. Place on a baking tray in the centre of a pre-heated oven for 12-13 minutes. Turn the Tomato and Mozzarella Bites half way through cooking time.